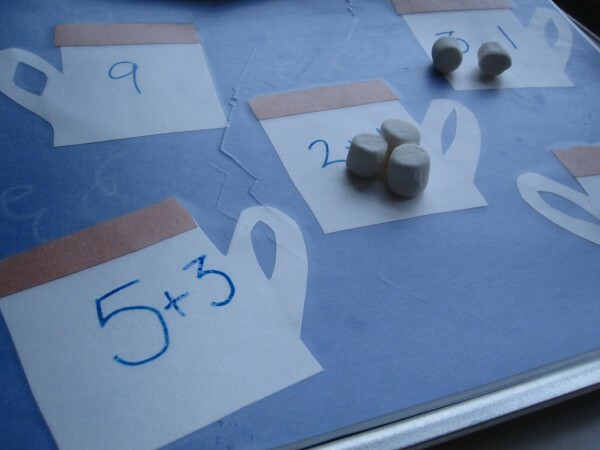 My son loves math and adding marshmallows into the mix pretty much made this activity one of the highlights of our snow storm fun last week. 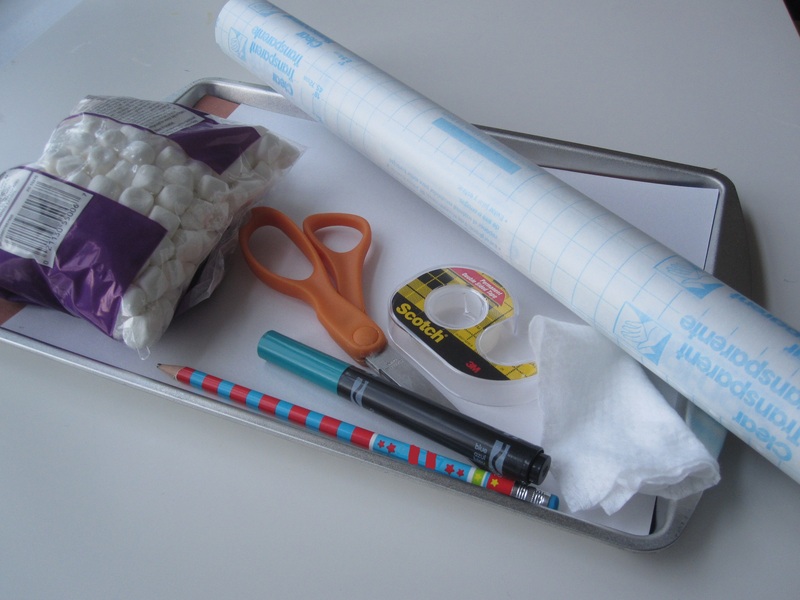 You don’t have to add the contact paper but by adding it becomes reusable and I was able to quickly make the activity more challenging when my original problems were too simple. 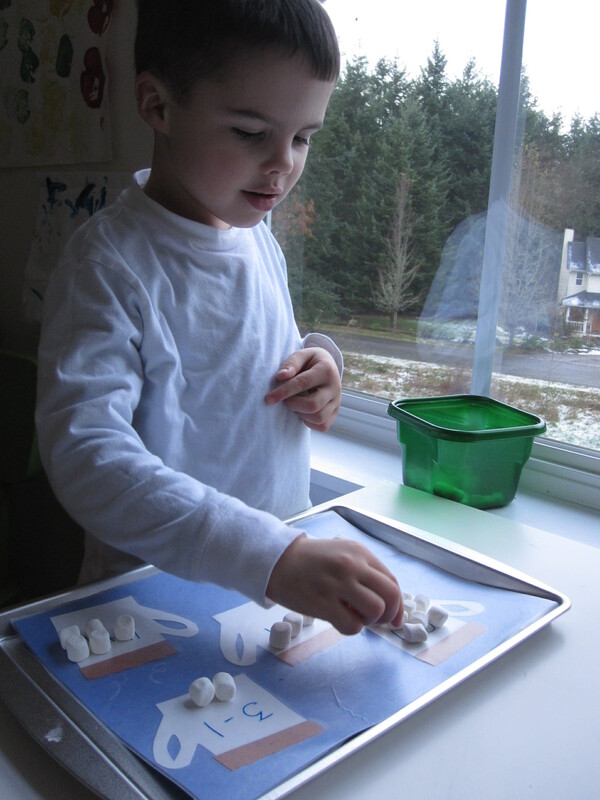 If marshmallows are not something you want to use as a manipulative try buttons, packing peanuts or cotton balls. Gather your materials. 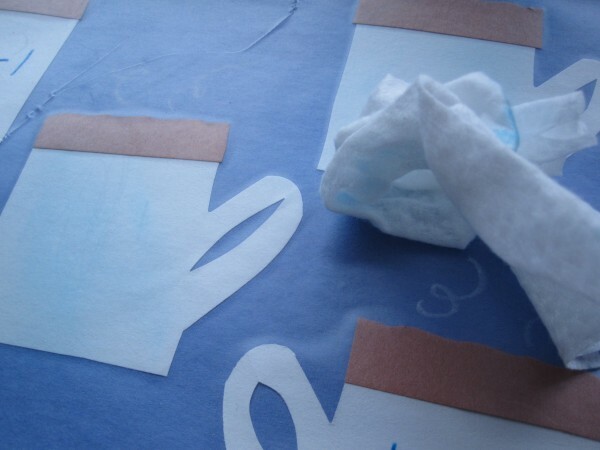 You will need 3 full sheets of construction paper ( backing, cups and strips of hot chocolate), a washable marker, double stick tape, a bunch of mini marshmallows, a white crayon for the steam, scissors, a tray or cookie sheet to keep it all together and a barely damp baby wipe for erasing the marker. 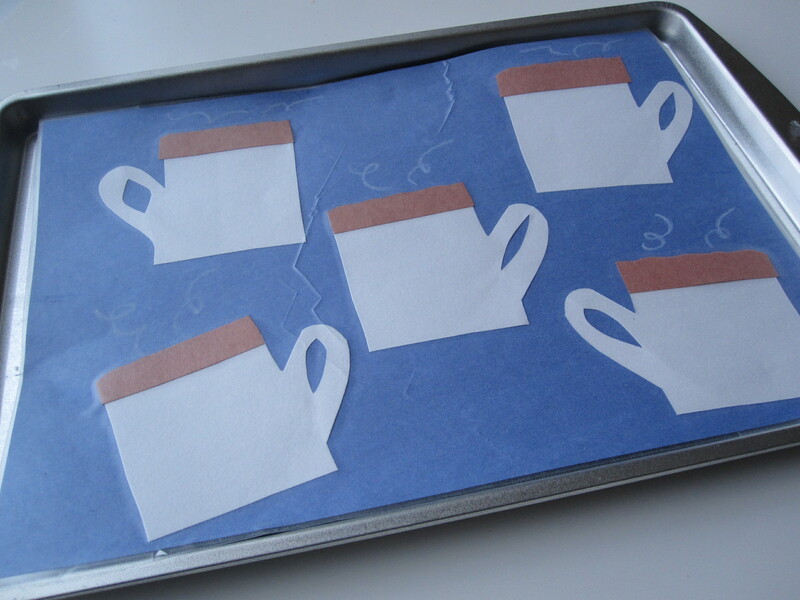 I like dollar store cookie sheets because they keep the manipulatives in one place and I can attach the contact paper on top . 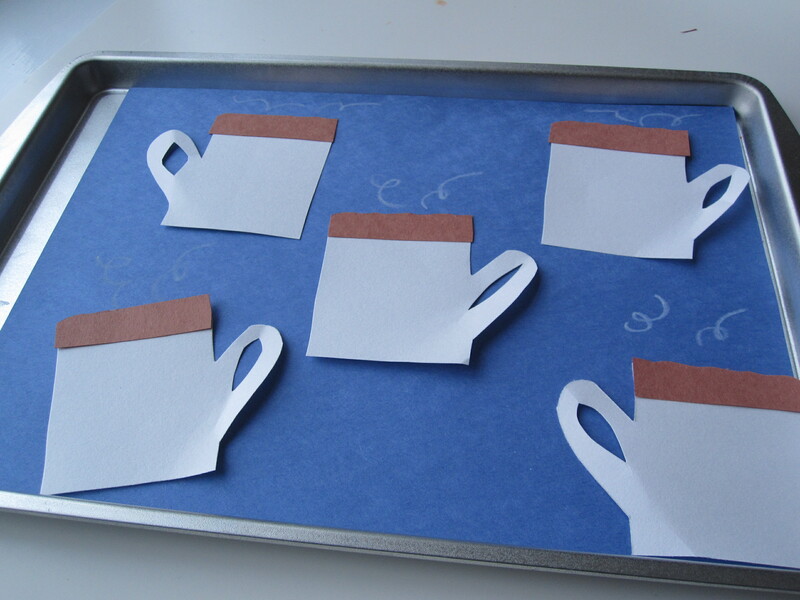 Start by drawing a mug and cutting it out. I then used it as a template for 4 more. Tape the mugs down, add a strip of brown to suggest hot chocolate and add some stem with a white crayon. Cover with contact paper. Don’t you hate it when you make a ridge in the contact paper, the stuff is too costly to just redo it too. I dream of one day having a laminator…. Using a washable marker write numbers or basic equations. I started with the ones above but as you will see had to change it to offer more of a challenge. That’s the beauty of the write and wipe surface. Add some marshmallows in a bowl and your little learner. I quickly changed 3+1 into 3-1 and the 5 into a 5+3 to test the waters. 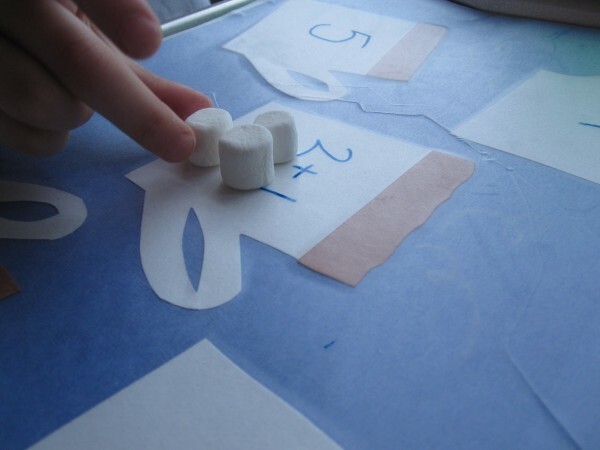 Magic of manipulatives- not a problem. 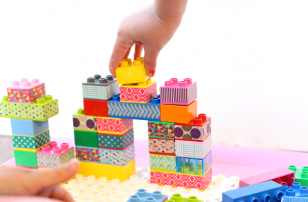 Finding just the right level of challenge is a bit of trial and error. My son didn’t think he could do 9-1 but he did. That is the perfect zone when they feel unsure of success but are willing to take a chance and take on the challenge. That is when new connections are being made. This stuff excited me beyond words. 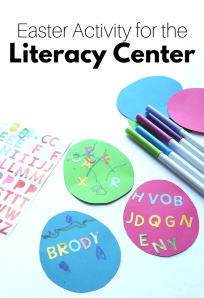 This is such a great activity because you can wipe it clean and customize it to your needs 2 months from now or right away for another learner. Love this idea. It is Awesome!!! Be great to do with “The Polar Express” story then have the real hot chocolate as a reward. Yummy…….At Christmas, My Aunt Claudia made the best hot chocolate–fresh milk from the dairy. Such great memories……Your son will have a zillion Great memories with a loving Mom like you. Great activity! I’m going to make one today! My son is going to LOVE this! Thanks for the fantastic idea. I can’t wait to try it with him this week. 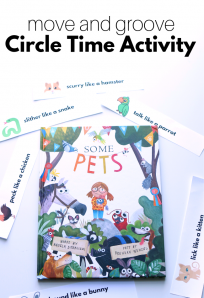 Love the activity! And adore that he was in the learning zone! Woo hoo! PS Can’t stand the contact paper wrinkles either! they drive me batty! I really wish I had the space for a great school quality laminator. This is waaaaay cute!! Planning on doing it soon!! Hello! I have recently discovered your blog and I love your work! I will definately do this activity in my class I loved it! Congrats! I recently discovered your fantastic blog!! It really rocks. I do have two questions for you. I know that you have contributors, but as I looked through some of the activities I didn’t see any mention of the sources of your ideas. Are these crafts your ideas? If you see something for example on Pinterest that you like and haven’t tried and then try it with your son, do you credit the source of the idea? Forgive me if I haven’t read through enough of your posts to see for myself. Another question, when you are writing for other blogs and magazines, do you always come up with a new idea or share a neat craft that you learned about from another blogger? The reason that I am asking these questions is because I aspire to write for other magazines, ect. but most of my ideas are from Creative moms like you. Your thoughts are very much appreciated. Keep up the awesome job! If there is no link to an idea yes I or my contributing writers have either used them in classrooms/ teaching for so long we aren’t sure who to source or we thought it up. We try very hard to post as many “new” ideas as we can to provide something different for our readers. That said we know that sometimes we post something and then find out another blogger has done it , in that case we try to link to them as well since we’d appreciate that in return. 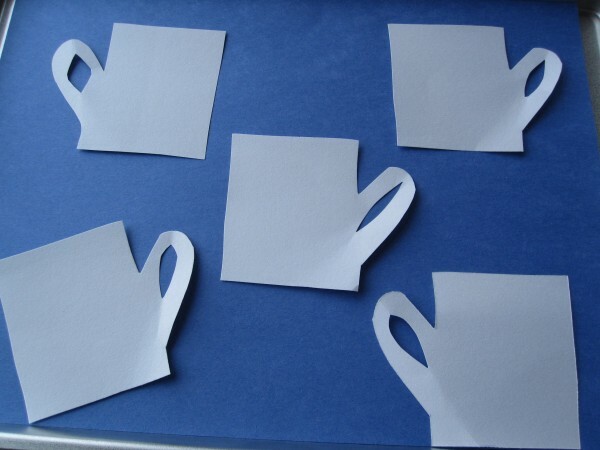 If we are inspired by something on another site we link to it and if we used a tutorial without making a significant change( I will be later next week) we take a photo of what we did but link to the tutorial for instructions. In my freelance work I often link to other ideas but always crediting sources, never reproducing the tutorial and getting full permission to use photos. I hope that answered your questions. Please feel free to contact me ( click contact on the menu bar) if you need more help! Your response does help. I appreciate you taking time to share your thoughts. Have a great day! I remember during my childhood years. I play â€œMath Chessâ€ very fun. If you win the game you will gain a reward of a chocolate or something that you want for the day. 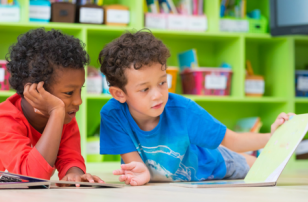 Kids really love the way of learning by means of playing. They could not forget the learning they gain for that day forward. Love your ideas! I recently made snowmen and put dots to count as well as the number. 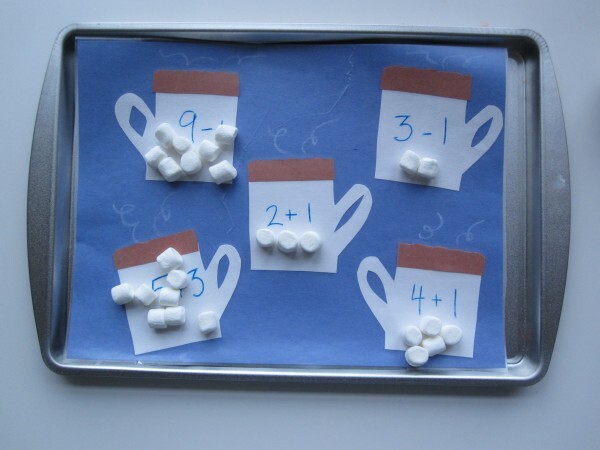 I stapled them on a paper cup and used marshmallows to use as counters.the children love these too! What a great idea! love this! Oh how I hate contact paper for that very reason you mentioned–but fortunately, I DO now have a laminator–courtesy of my Costco ($24.99 and came with 50 letter sized pockets and small wallet sized ones too)–and man, I use the heck out of it! 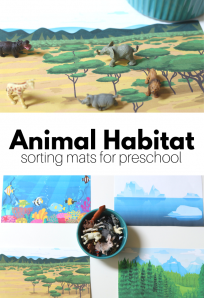 I think I will try this idea with other shapes and designs because I think my son will love it. Though he adores hot chocolate and marshmallows–so I might give this one a try first! Great blog! Thanks! Wonderful idea! I was actually thinking of making a math game just like this! (I’ve got some stale marshmallows in the cupboard) I followed your instructions, but there is one problem! My washable markers are being weird. How did you get the math facts to be so clear? My numbers keep turning into little dots as they dry. This makes it kind of hard to read. Any suggestions? Oh no! I would try dry erase markers instead. Awesome I am going to put this in a Math Center when we return to school in January. Snowmen with buttons, Santa faces with cotton balls, the possibilities are endless. 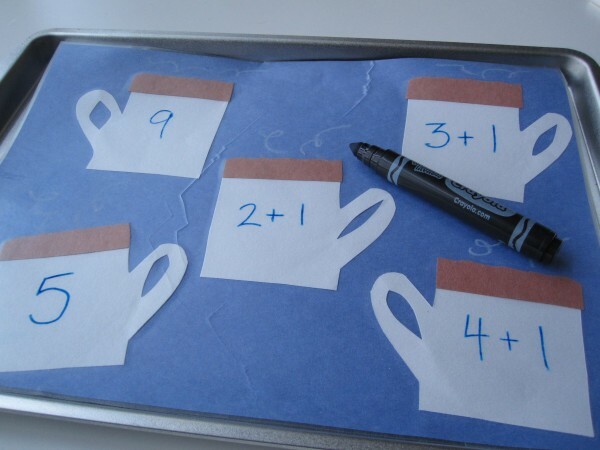 Great idea for math stations. 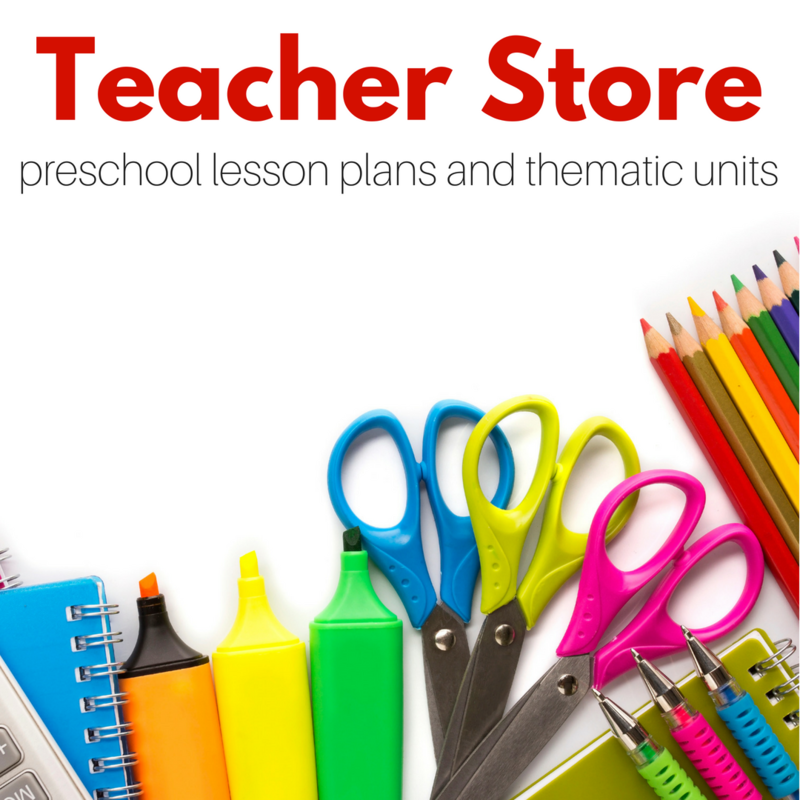 School supply stores will laminate! Love your creative teaching ideas. 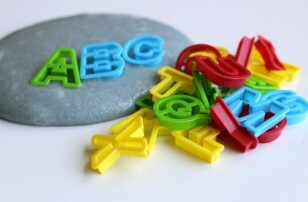 We are an education product for children, you can check us out on http://www.10on10.in and our Facebook page. 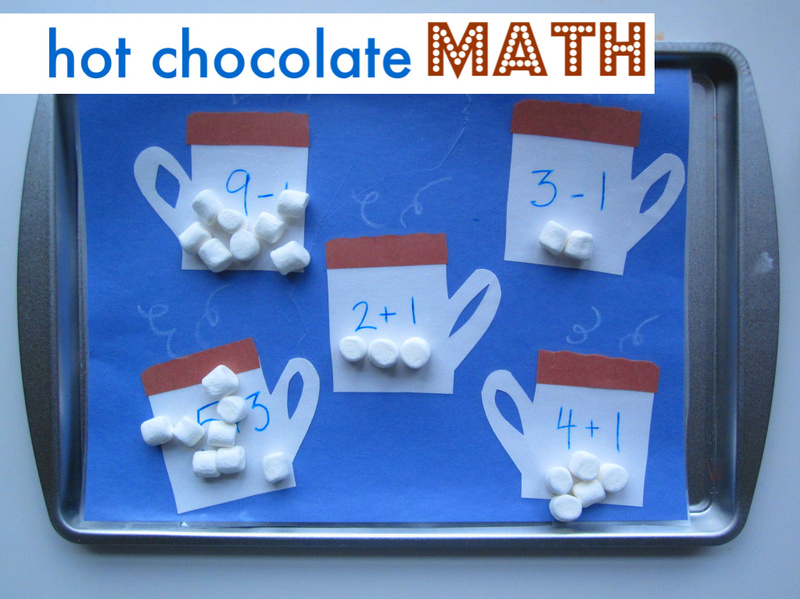 Have linked ur hot chocolate math idea on our Facebook page.